How old is the electrical service panel in your Hartford home? Do you know when it was last inspected? Many homeowners make the mistake of thinking that, just because the lights come on when they flip a switch, everything with their electrical system is fine. However, if you have an old electrical service panel, you could have a safety hazard in your home. If you need an electrical service panel upgrade, the professional electricians at Electrical Connection can help. An old, out of date electrical panel can be a fire hazard, especially in homes where the wiring is also old. It is also possible, depending on the age of your home and the date of your last electrical panel inspection, that your panel is not up to code, even if it seems to operate properly. The electrical panel plays an extremely important role in the distribution of electricity throughout your home. It is also a very important component of keeping your home safe. The professional electricians at Electrical Connection are fully trained and certified to handle the inspection and, if need be, replacement of your electrical panel. 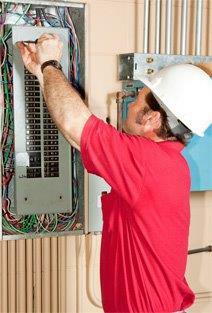 Age is not the only factor that helps determine whether or not your electrical panel needs to be serviced or replaced. Any issues with your electrical panel, such as circuit breakers that trip with any frequency, must be taken seriously and evaluated by a qualified professional. Your dependable access to electricity, as well as your safety, is too important to take any chances with. When you need a service panel inspection in Hartford, just give us a call. To learn more about the operation of your electrical service panel, or to schedule a service panel inspection in Hartford, call Electrical Connection. You can trust us to keep your home and electrical system as safe as possible.